· Did a lorry bring your boat here? · Can I have some water for my dogs? The wind dropped during Saturday evening and we bravely participated in the illuminated boat parade: on board were two veterans of our boat, two colleagues and a spouse and two neighbours. Last minute instructions were given re. Lighting Up: travel black until the sound of the Harbourmaster’s horn. With so much noise from the banks which was his horn? “Lights on!” shouted our skipper and in the cabin we scrabbled to press plugs into sockets. I managed my task –but could not see my illumination. “Yes, it’s lit,” shouted Chris, chief lookout. By the front deck steps we scrabbled around with unfamiliar fairy lights, the “hairnet” over the bow, but then success. From the bank calls of appreciation: “Look, a helicopter”. So Ken night-cruised at Bedford, the name Cleddau a geographical reference to those inspirational fifties flying boats and a Christmas decoration a reminder of his professional past! Craft of all kinds were participating, from the brash and loud Diamonds are forever (Bedford Boat Club) to the tiniest of outboard boats bedecked as a festive tree. Turning a large, heavy steel boat, not equipped with that helmsman’s gizmo, a bow-thruster, can be challenging, as certainly it was in the dark. But all went well and as the last rope came ashore for mooring up so started the firework display. Though trees hid the lower display we could see and hear the higher bursts of colour. The raft races on Sunday afternoon brought even more crowds to the bank, supporters of local teams and companies. Paddling a half-sinking raft proves hard work; though most seemed to make it to the end many tilted dangerously; some crew plunged into the water to push and swim their vessels downstream, waterfights broke out, and right opposite us two paddlers abandoned ship, swam ashore, climbed out and proceeded to wet-hug any members of the crowd foolish enough to stay close by! The afternoon dwindled away, as did the crowds and the decision was made to de-flag the craft, prepare for departure – and line up for the lock. 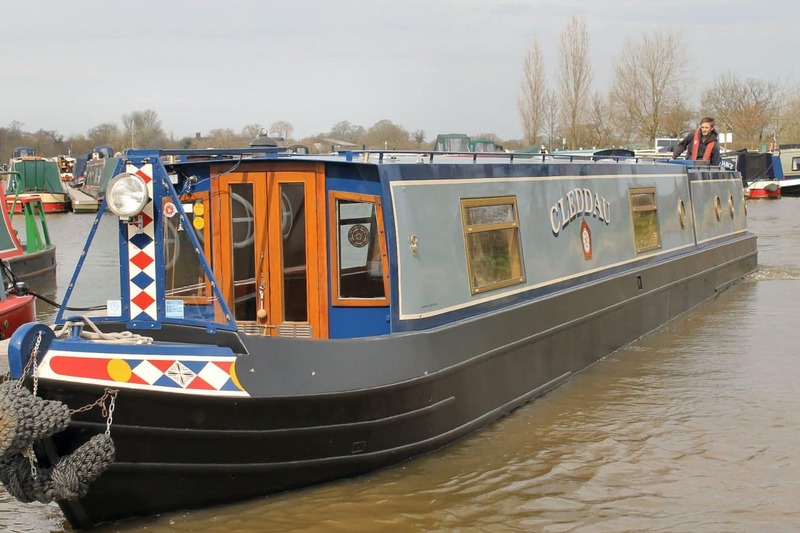 Some hours later Cleddau was safely moored up again in the Bedford marina. Our crew looked gratefully at the 4-wheeled transport to take them to a morning train – and a phone call summonsed Ken to a 10am meeting at Borough Hall. Probably over fifty illuminated boats participated – but only two narrowboats, so we were second out of two in a competition we didn’t know we’d entered! The prize? an impressive trophy with engraved plaque! Something else to buff up with a polishing duster!